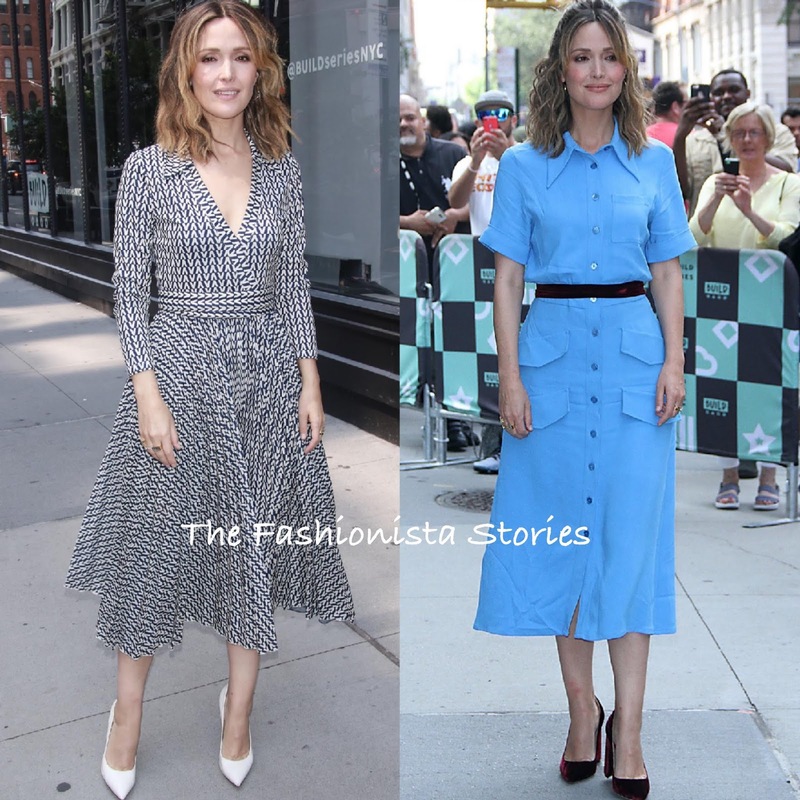 Following the premiere, Rose Byrne stepped out earlier today(August 15th) in New York to promote 'Juliet, Naked' at SiriusXM radio and the Build Series. Following her appearance at SiriusXM radio, she was spotted arriving at the Build Series in the same look which featured a VALENTINO RESORT 2019 'V' logo long sleeve dress. Her v-neck, knee length dress featured a collared neckline and a pleated, flare skirt. Center part waves and white GIUSEPPE ZANOTTI pumps topped off her look. For her appearance at the Build Series, she switched into the ROCHAS RESORT 2019 'Onachom' blue shirt dress, featuring a swallow tailor collar, a button closure and a patch pocket bodice & flap pocket skirt. Instead of wearing the snake embossed & green panel belt from the look book, Rose switched it for a burgundy velvet belt which matched her CHLOE GOSSELIN pumps.